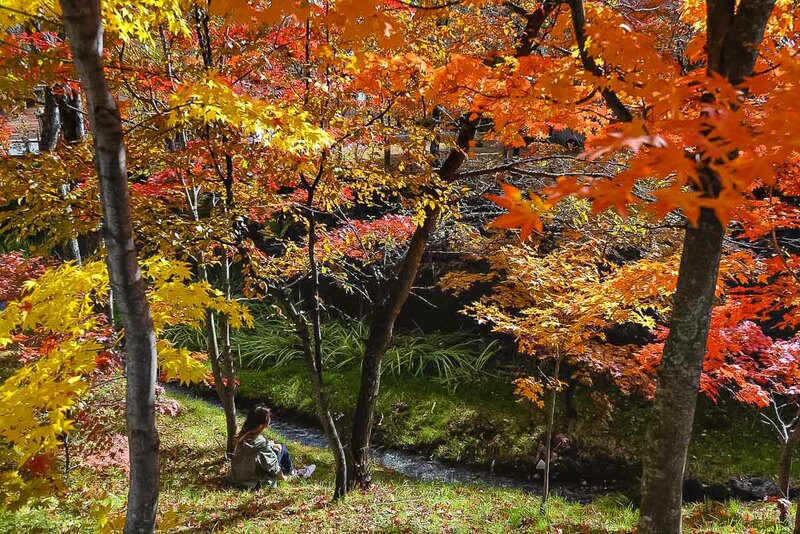 The mountainous prefecture of Nagano and the Japanese Alps are Japan’s best-kept secrets. Whilst popular amongst locals, it remains fairly undiscovered amongst foreign tourists. 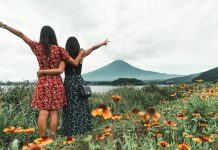 Escape the city, see a different side of Japan and reconnect with nature! 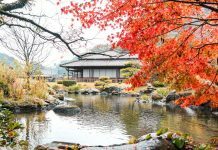 3 hours North of Tokyo, Nagano is a breath of fresh air (literally) from the urban landscapes of its nearby cities. 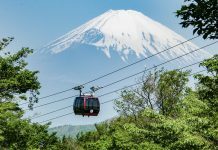 It is a natural wonderland famed for its dramatic mountain sceneries, history and townscapes that retain the small town charm of old Japan. 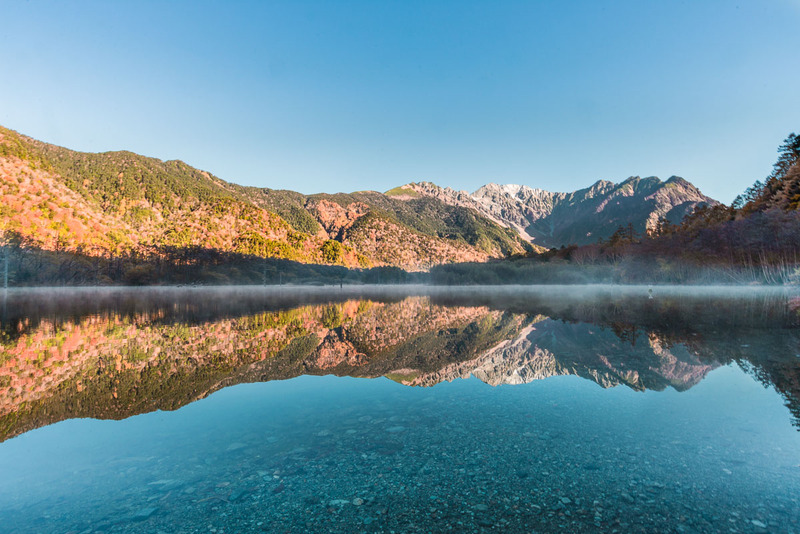 In this guide, we introduce the top rated spots in three areas within the Nagano prefecture — Matsumoto, Norikura and Kamikochi. 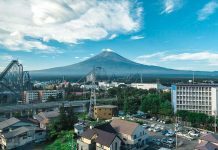 Home to a range of outdoor activities, natural onsens and stunning views of the Northern Japanese Alps, these cities make the perfect destination for adventure seekers as well as those seeking a relaxing holiday. Anyone who needs a little time out from life will fall in love with the area — I surely did. 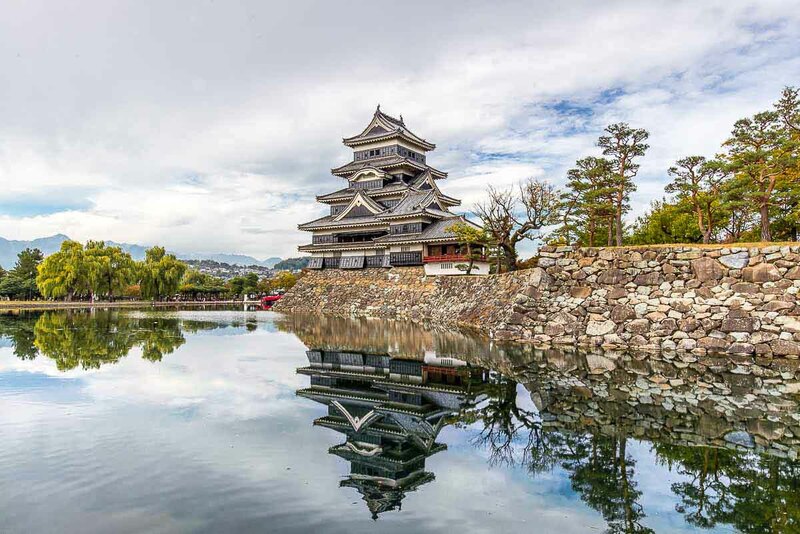 Matsumoto city has plenty of ‘off the beaten track’ sights to uncover. Spend a day or two to experience the wonder of tradition and nature existing side by side. It’s also a convenient pit-stop from Tokyo before heading into the mountains. 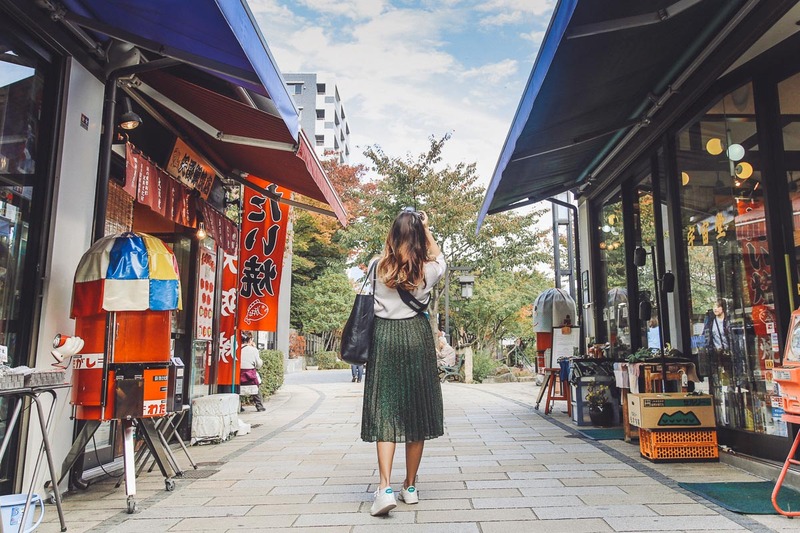 If you’ve time to explore Tokyo, here’s some inspiration for places to stay, things to do and eat! For travelling within Nagano, purchase the transport passport by Alpico for your adventures around Matsumoto, Norikura and Kamikochi! 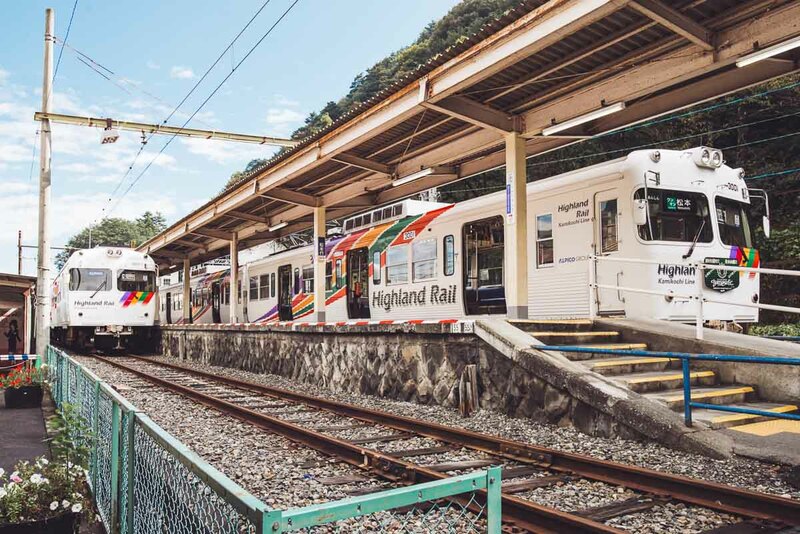 At ¥7000 (~S$85.00), the 2-Day Plus One adult pass offers 3-days of unlimited travel on Alpico’s buses and trains. 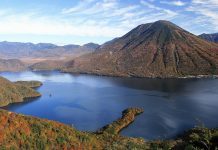 Areas include the Matsumoto City area, Kamikochi, Norikura Highlands and Shirahone Onsen. Apart from transport, your ticket also entitles you to discounted entrance fee for certain tourist attractions. Most of Matsumoto’s key attractions are within walking distance from the Matsumoto station. But you can opt to use the transport pass or rent a free city bike to take you around. These green bikes are available for rent from 9am to 5pm, but you can return the bikes up until 9pm. 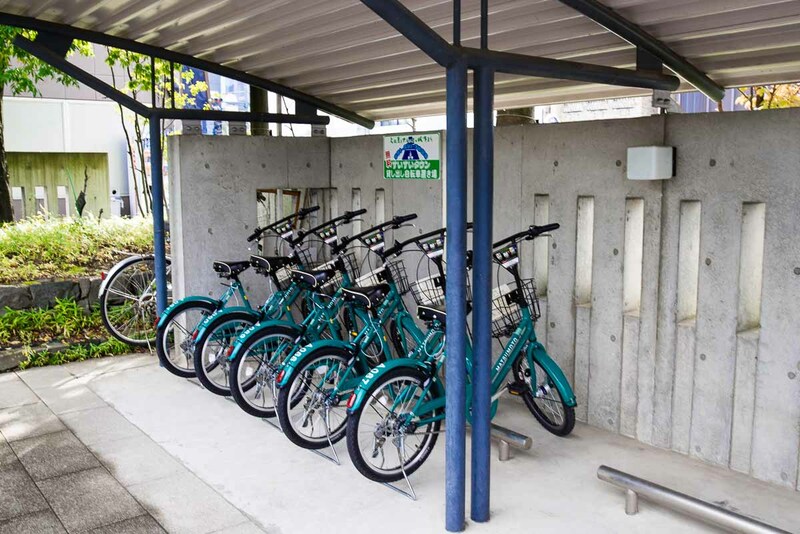 Find them outside Matsumoto Station’s Castle Exit (East Exit) and at key tourist attractions as stated on this rental bike map. 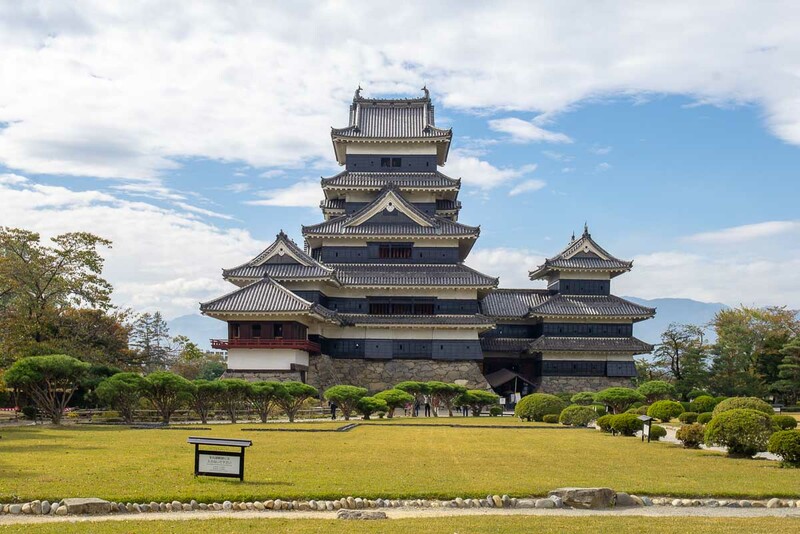 In the cultural arena, the main landmark is the Matsumoto Castle, one of the only four castles designated as National Treasure of Japan. Did you know, that the castle still retains its original wooden structure from 400 years ago? Get interesting nuggets of information while touring the castle grounds with a volunteer guide! This service is free and available in English, Chinese and other major foreign languages. 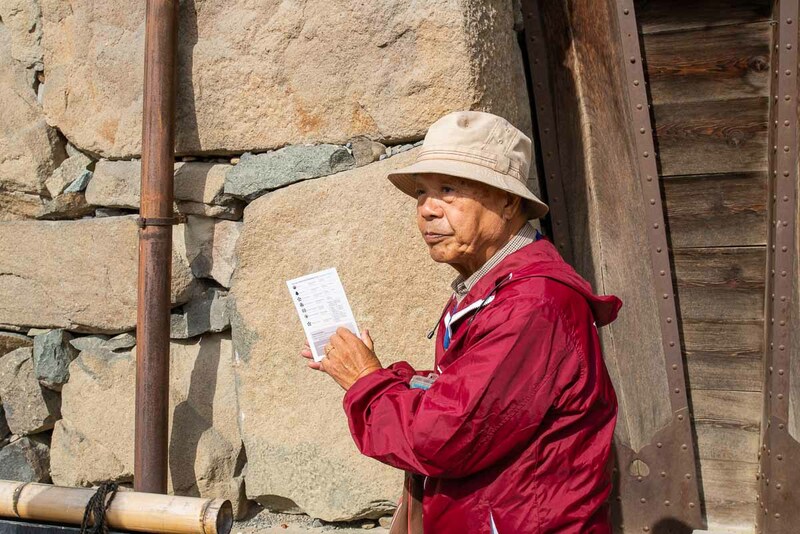 Like most of the other guides, our guide Imamura-san is a retired senior who loves to meet new people, practice his English and wants to keep active by bringing tourists around. The garden surrounding the castle is worth a stroll, especially during spring and autumn. You might even bump into a local samurai for a photo or two! During autumn, there is an exhibition of one of autumn’s most defining blooms — the chrysanthemum. Its sixteen petals are emblematic of the Japanese imperial family. Round the corner within castle town are little shopping streets with charming old buildings that make for a good stroll. Nawate and Nakamichi street run parallel to one another. Be sure to pop by Kurassic-kan a restored sake brewery built in the Meiji Era along Nakamichi street. 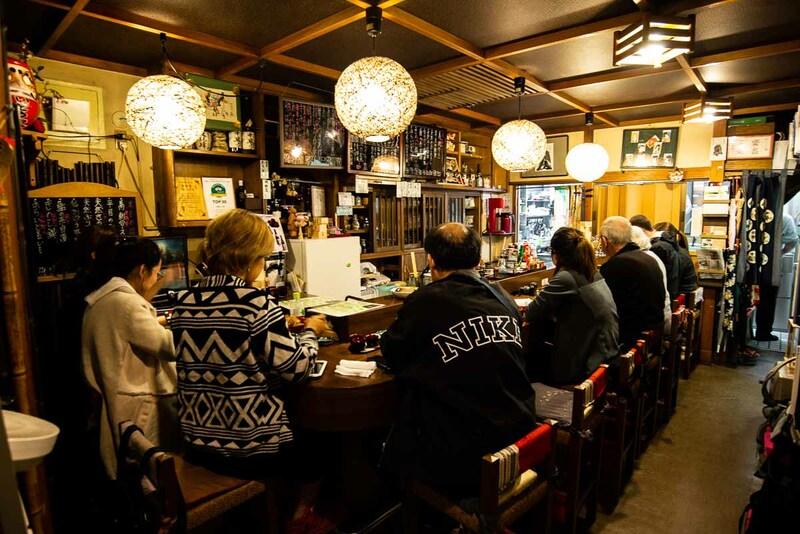 Admission is free and the cafe located inside the relaxing atmosphere of an old kura (earthen-walled warehouse) serves traditional Japanese cakes and sweets. Nawate Street is a car-free zone to preserve the Edo-style atmosphere. 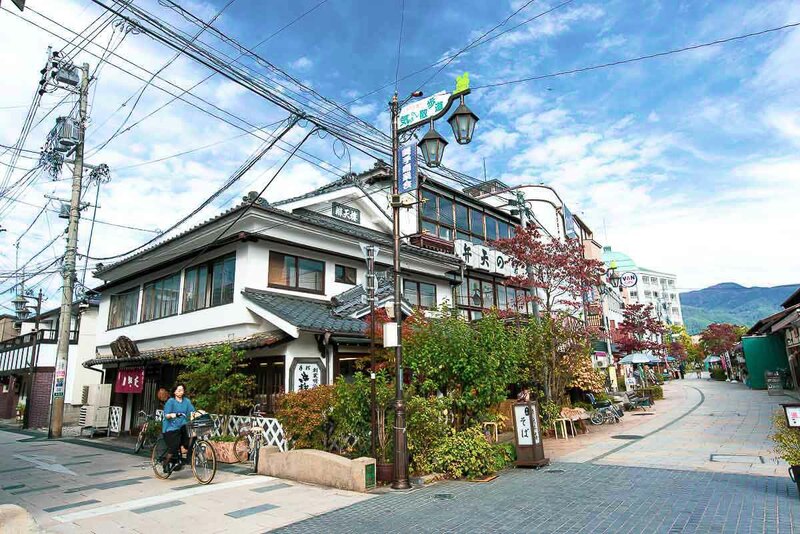 The street is lined with small eateries and quirky shops where you can buy trinkets and Japanese-style snacks. Note that most stalls are closed on Wednesdays, but the atmosphere of old buildings and shrines makes it worth walking down. 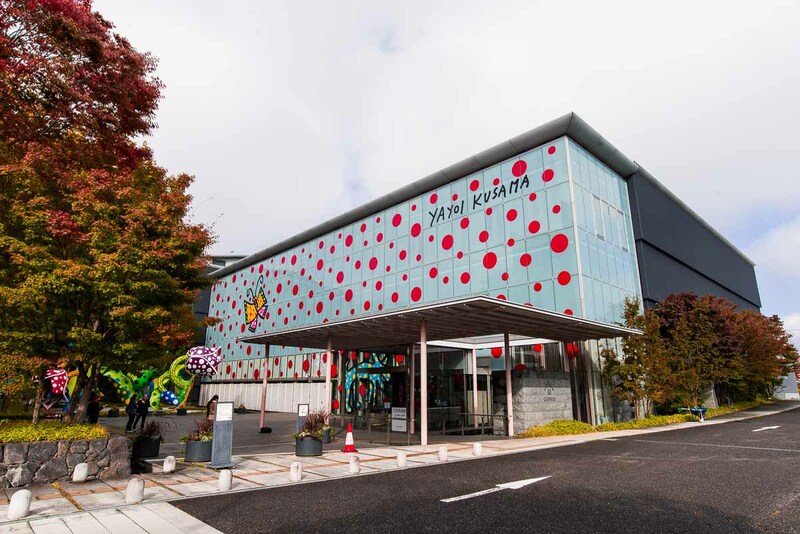 Look out for the signature polka dots of Yayoi Kusama when in Matsumoto! 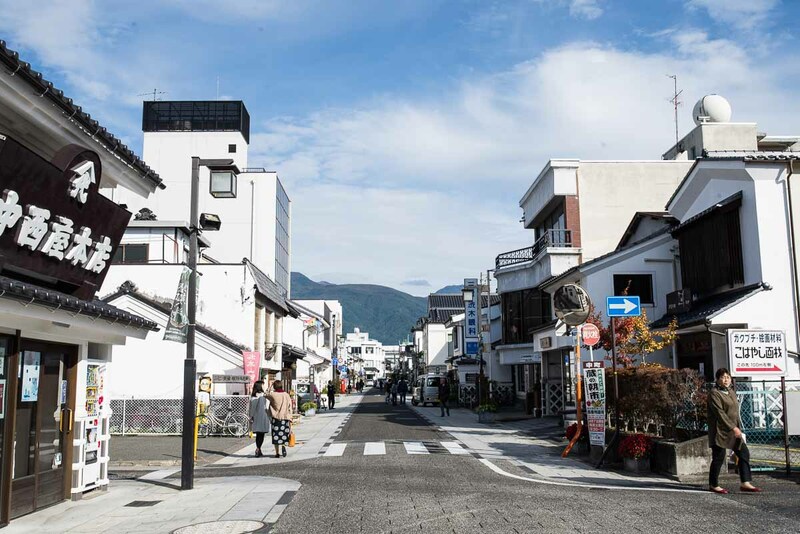 As the birthplace of the world-renowned artist, the Matsumoto City Museum of Art offers you a closer look at Kusama’s life. The exhibition features works ranging from her childhood art to her enormous, awe-inspiring paintings. 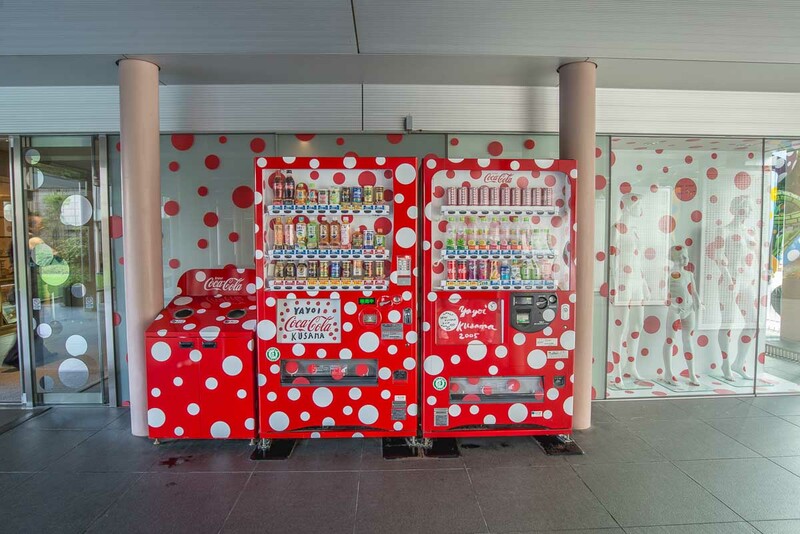 Fully immerse yourself in Kusuma’s world by taking the only Kusama-designed bus to the museum and get a drink from the dotted vending machine! Daio Wasabi Farm is the largest wasabi farm in Japan opened to the public. It is located in Azumino just 30 mins away from Matsumoto city and entrance is free! 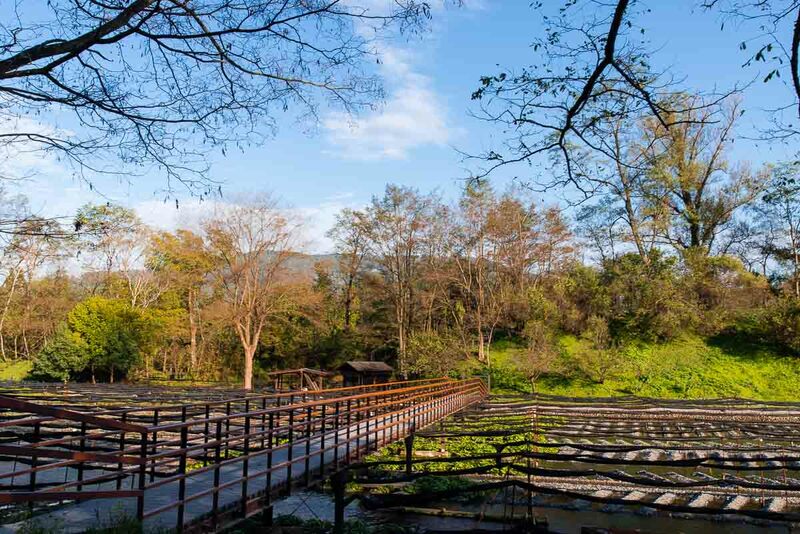 The picturesque farm features romantic water wheels, tranquil streams and large wasabi fields with a pristine network of irrigation channels. 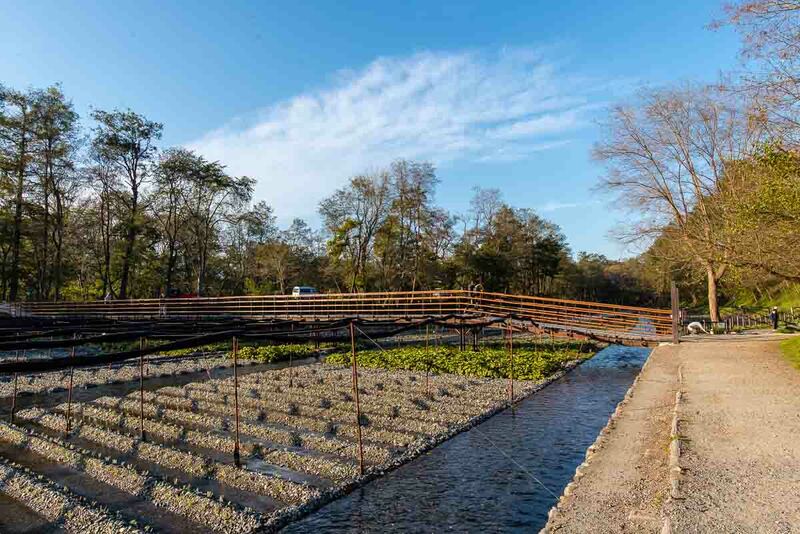 Visitors can tour around the 15-hectare farm at their own pace or take a guided tour. 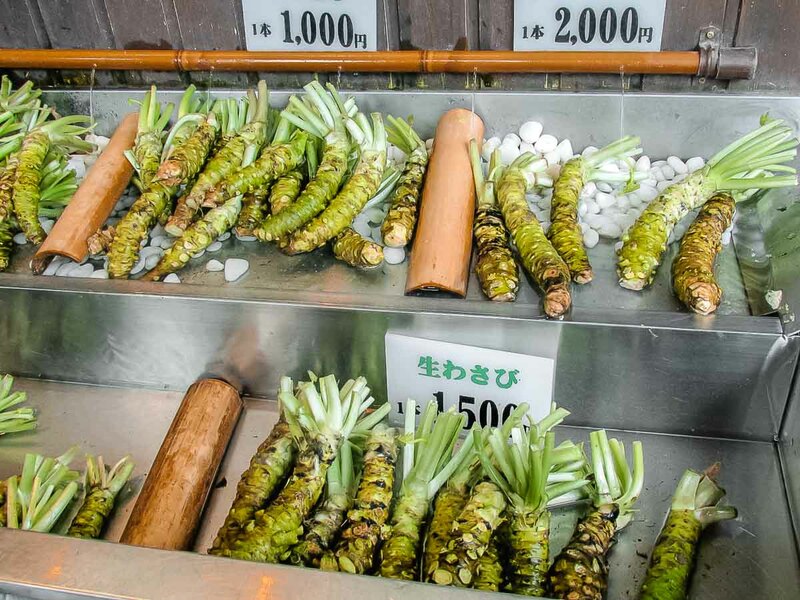 We’ve all had wasabi, but have tried the real deal? What we eat in most restaurants is actually a blend of horseradish and wasabi leaves as real wasabi can’t keep up with the commercial demand due to strict farming conditions. 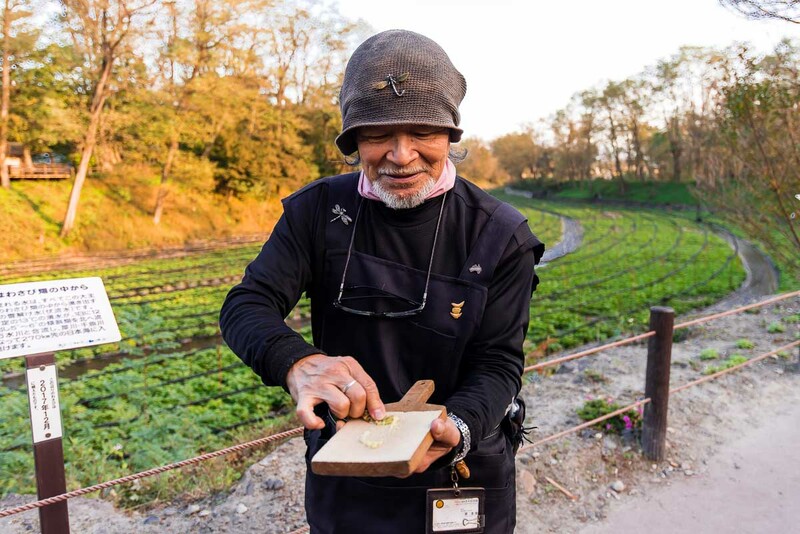 Wasabi can only be cultivated where pure water flows and Azumino (where the farm is located) is blessed with clear snow runoff from the Japanese Alps. At the end of your visit, stop by the cafe area to try all things wasabi — Wasabi ice-cream, Wasabi sausages, Wasabi juice, Wasabi beer etc. If you’re lucky, snag a wasabi plant home to grind your own fresh wasabi — these sell out really fast! This is one of my highlights in Matsumoto. 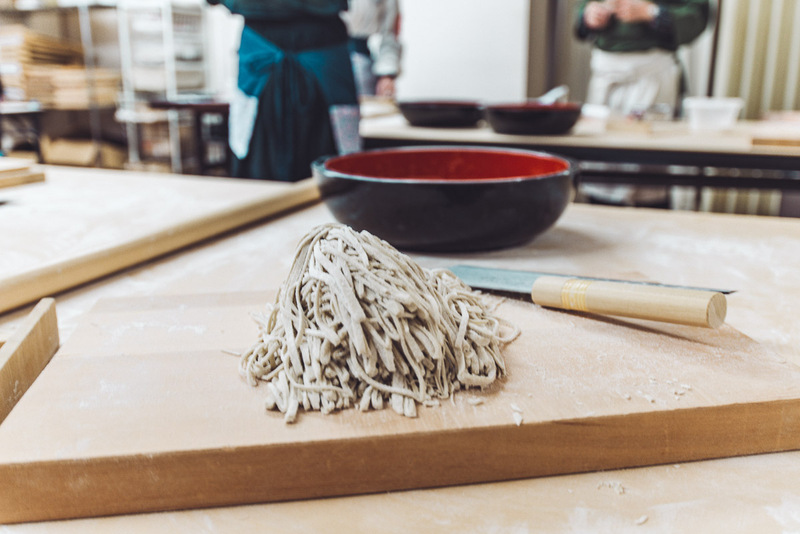 Nagano is the land of soba, so you definitely can’t miss the chance to learn how to make soba from scratch. 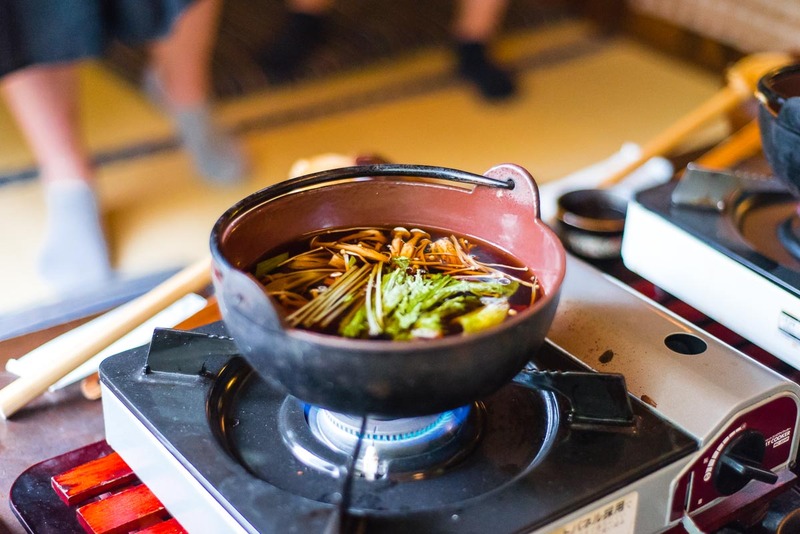 At Takagi, you get to learn how to make soba from the master himself. 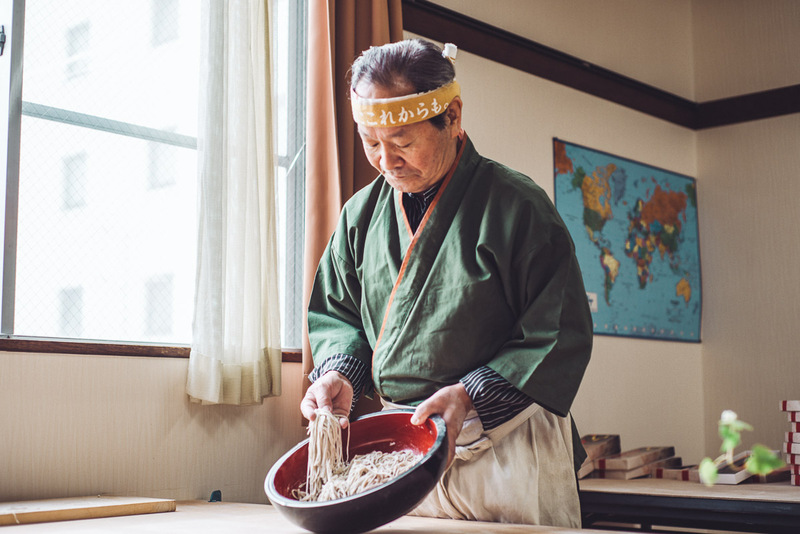 Mr Takagi Ken has 45 years of making soba and he’ll patiently take you through the process of kneading the dough to slicing it into noodle form. It’s definitely not as easy as it looks, but all in good fun! The soba class costs ¥3000 (~S$36.40) per person and you get to make three portions worth of soba. A minimum of two people is required. After the session, dig into your freshly made noodles in the restaurant below. Having it prepared the traditional cold dipping style is complimentary but feel free to opt for other cooking styles at a small fee. We topped up ¥1000 (~S$36.40) to have it Tōji style, a popular way of enjoying soba in Matsumoto. 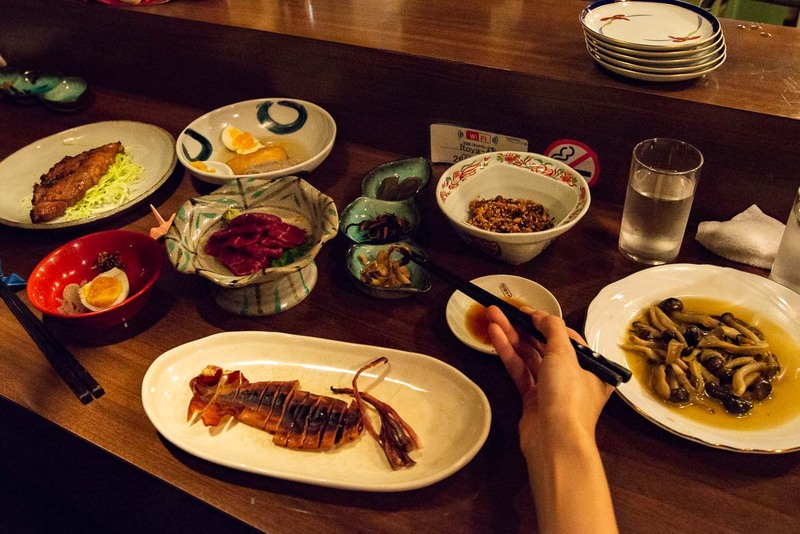 Highly recommended on Tripadvisor, Ito-ya Izakaya is a 10-seater family-run restaurant with a laid-back ambience. Kumiko’s warm hospitality will put you right at ease the moment you step in. 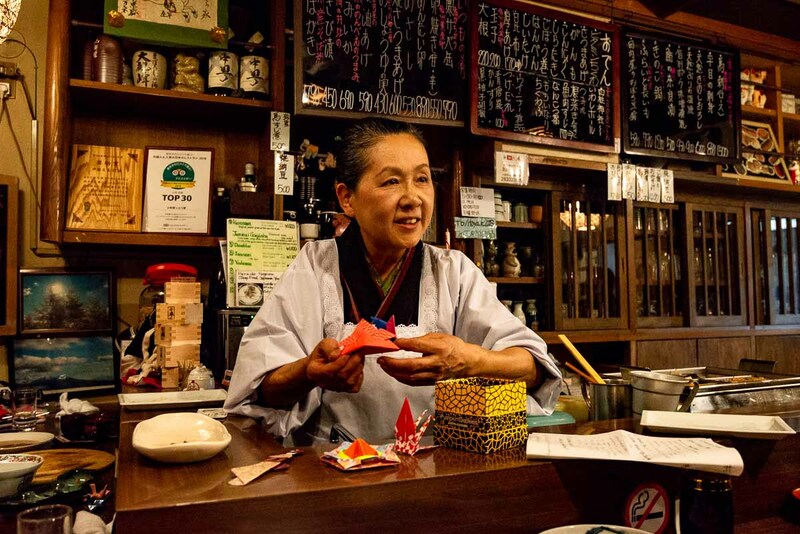 Feel free to ask her about her recommendations about things to do in Matsumoto! She’ll be more than happy to engage in conversation and even teach you basic Japanese. The menu offers something for all tastes and is far more representative of “real” Japanese food than the high-end kaiseki joints that cost a fortune. If you have more time in Matsumoto, there’s also the Miso Brewery tour and Samurai sword fighting that are worth checking out. 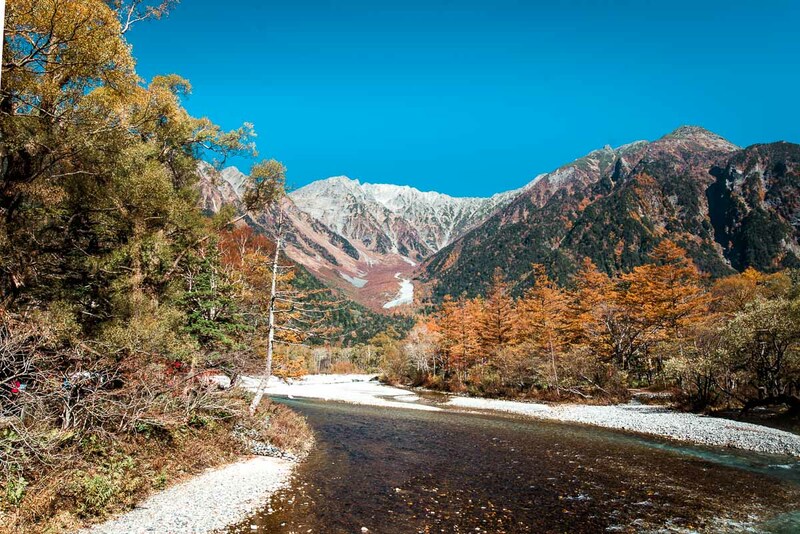 Norikura highlands at the base of Mount Norikura provide ample scenic spots with beautiful mountain vistas, lush forests, cascading waterfalls and attractive hiking. 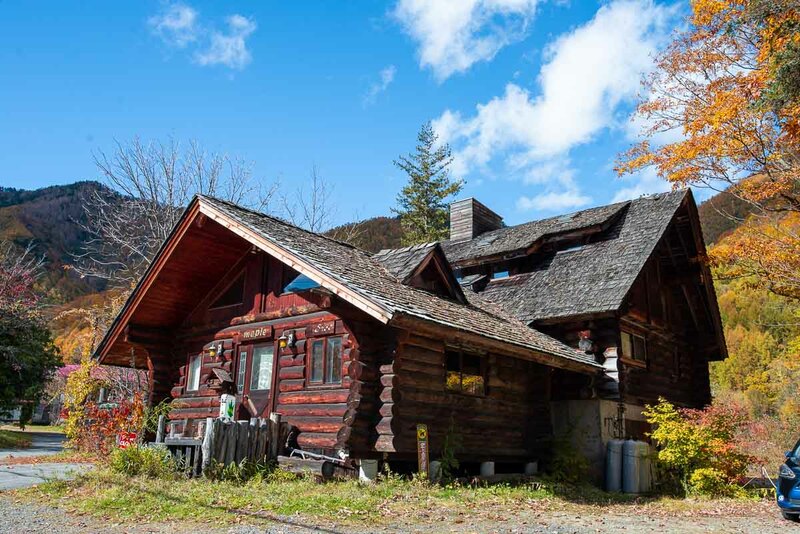 The area is also known for outdoor hot springs amidst stunning natural settings that allow you to enjoy the full pageantry of the changing seasons. In autumn, the clear skies, receding humidity and tree branches pendant with bright, orange, gold and red leaves make it the very best of seasons to visit. From Matsumoto, you can get to Norikura by bus, train or chartered car but the train offers the best views. Take the Kamikochi line from the main train station and stop at Shin-Shinmashima Station (30mins). The Kamikochi line is non-JR so your Japan rail pass will not be valid. From there, change to the pink bus heading towards Norikura Highlands and alight at Norikura Kanko Centre (Tourist Information Centre) (45 min). The orange bus takes you to Norikura, and the green bus to the onsens. All these are included in your Alpico transport passport. Mountain biking in autumn offers an unforgettable experience: the change of colours, the smell of the woods and the days that are crisp and cool. 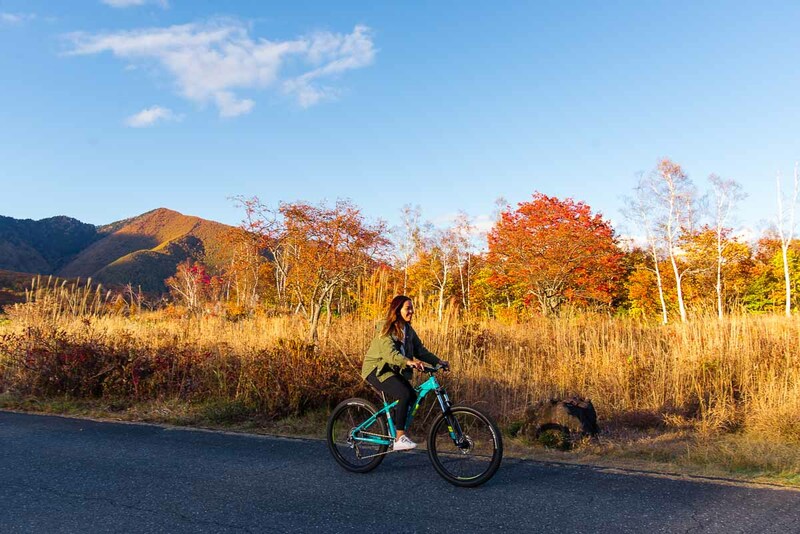 Biking through fall colours is a guaranteed Instagram-worthy adventure! Northstar provides mountain biking lessons and tours for beginner cyclists and families. The beginner bike path is about 5-6km and last approximately 90mins. Advance cyclists can rent one of their perfectly maintained bikes and head off on their own adventure. Cafe Maple is a cosy restaurant that dishes up hearty portions of home-style Japanese food at a reasonable price. You can find it just down the road from the tourist centre. 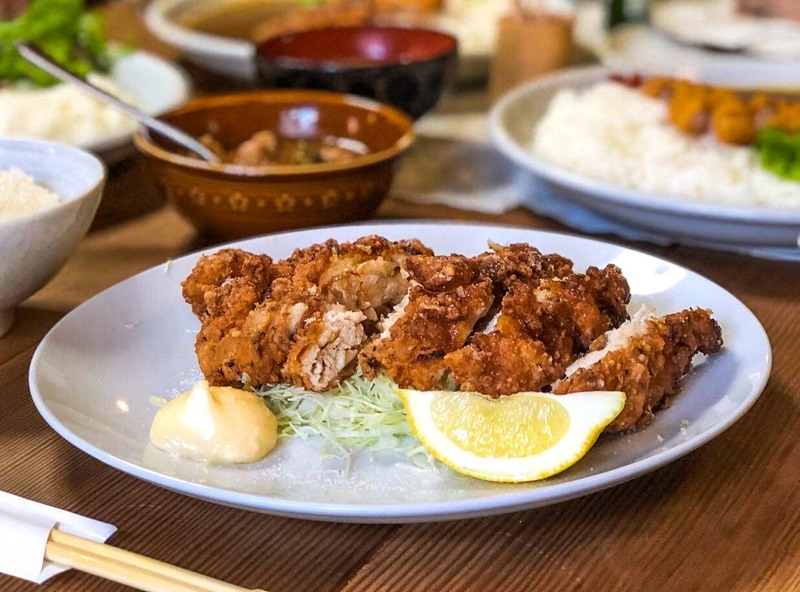 Be sure to try the regional speciality, Sanzoku-yaki (山賊焼き) — a large piece of juicy deep-fried chicken coated generously with teriyaki seasoning. Served together with rice, salad and soup, this is a hearty lunch perfect to take you through the day’s adventure in the mountains. 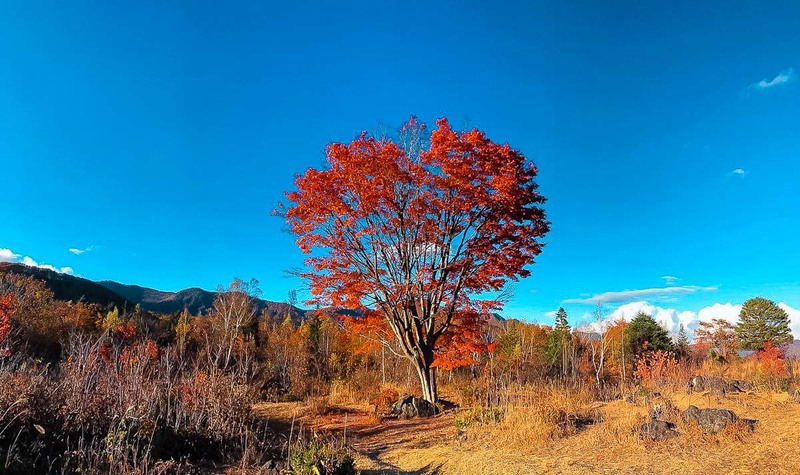 There’s so much more to life in the mountains — nature hikes, onsens and camping that you can discover with the help of the Norikura Kogen Tourist Association. If you’re visiting during May–June, the ice-walls near the peak are a sight to behold. 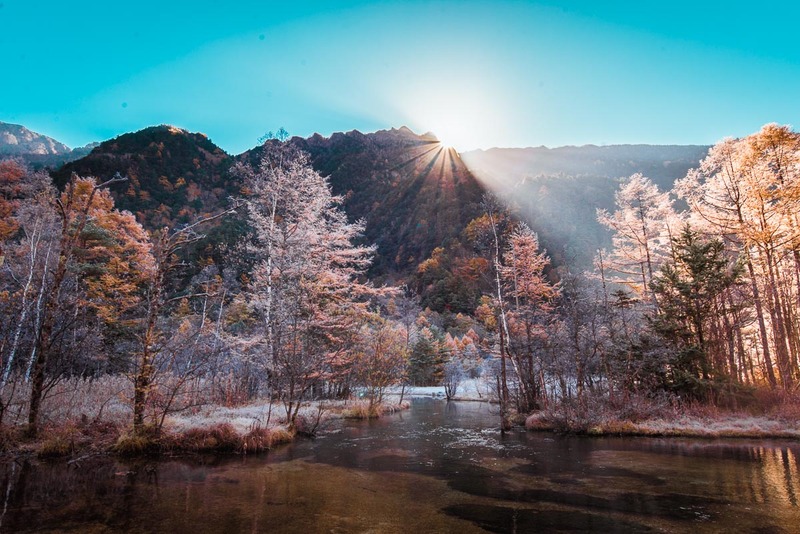 Kamikochi is where you can surround yourself in the beauty of the grand, untouched nature. 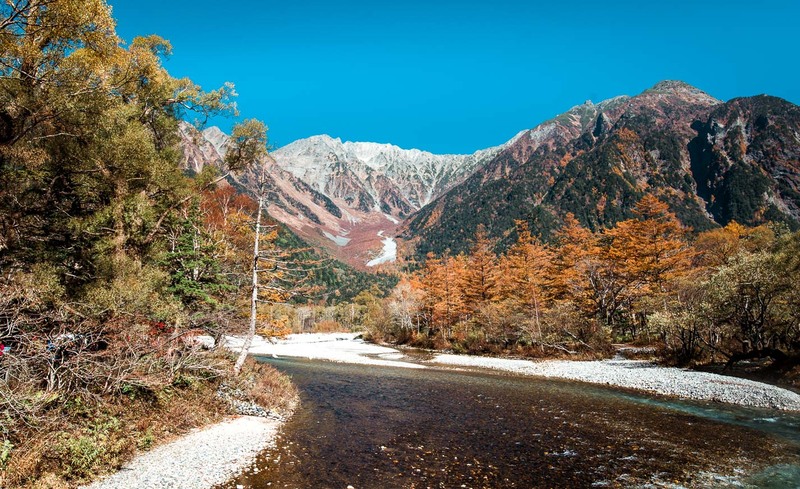 From laid-back nature trails in the stunningly beautiful Kamikochi to the towering, 3,000-meter peaks of Mt. Hotaka and Mt. Yari, here you will find a trail for everyone. From Norikura take the bus back to Shin-Shimashima Station but transit at either Sawando bus terminal (K-20) or Oyako-daki (K-17) to Kamikochi. The entire journey takes about an hour. As a designated cultural site of Japan, access to the public is only allowed by bus or taxi. If you’ve rented a car, it has to be parked in the designated parking areas outside the park before you catch the bus back in. It is important to note that Kamikochi is only open from mid-April to mid-November and closed during the winter. 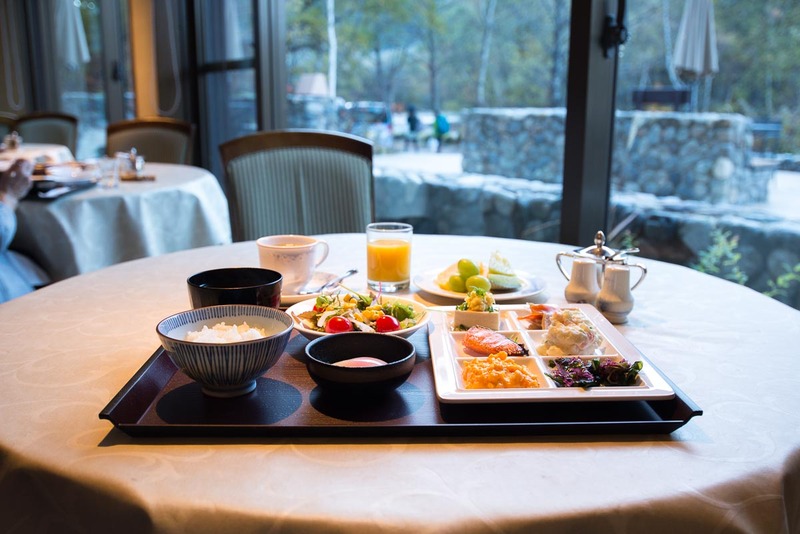 Opt for the Kamikochi Lemeiesta Hotel for a truly unforgettable stay in the mountains. The alpine lodge rooms all come with spectacular views of the river and mountain. 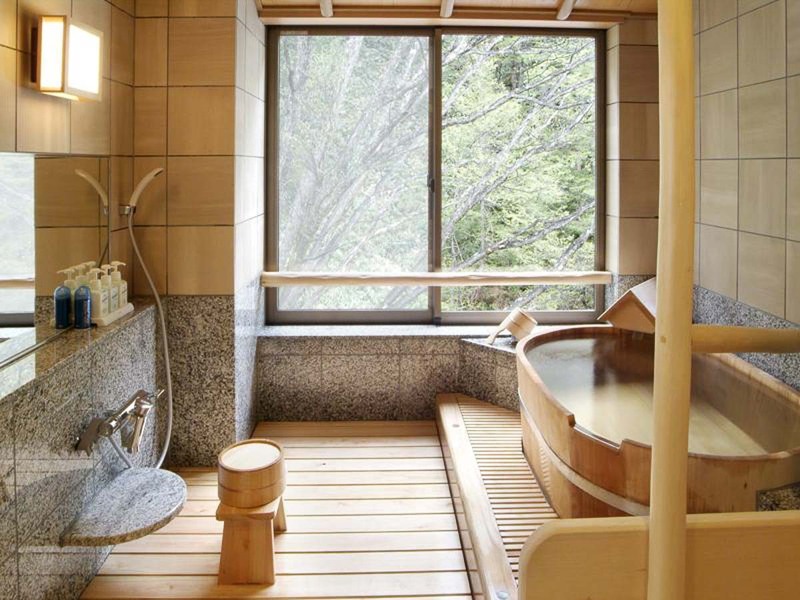 It is also one of the only two hotels in Kamikochi with an onsen inside the hotel for its guests. Trust me, you’ll appreciate the convenience after a long day of hiking activities. The therapeutic properties of the bath will relax those tense muscles and have you ready for a brand new day. As there are no restaurants nearby, all guests dine in the hotel. For breakfast, the buffet lineup consists of expertly prepared dishes to make up your own traditional Japanese breakfast set. 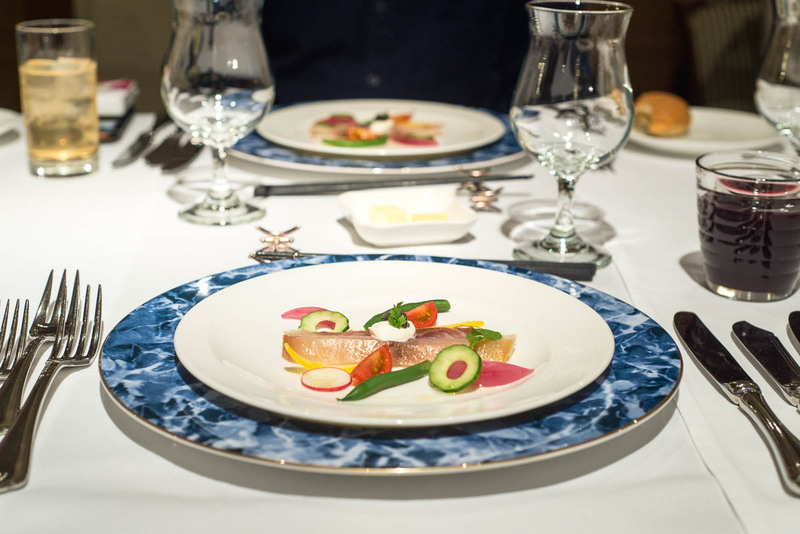 For dinner, tuck into a seven-course fine-dining French dinner that utilises only fresh domestic produce. Up in the mountains is the best way to experience the uninterrupted night sky. 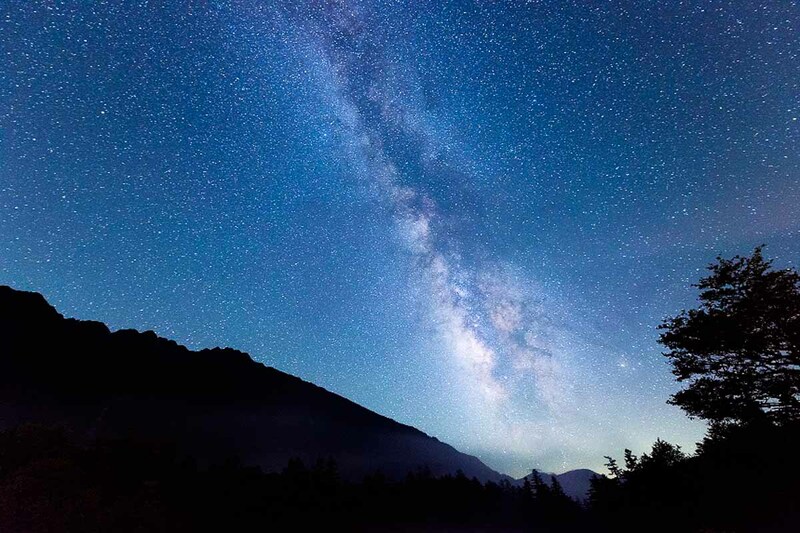 The hotel organizes star-gazing activities when the weather permits. In fact, the hotel has been voted as one of the top ten hotels for star-gazing by star-gazing enthusiasts and photographers! 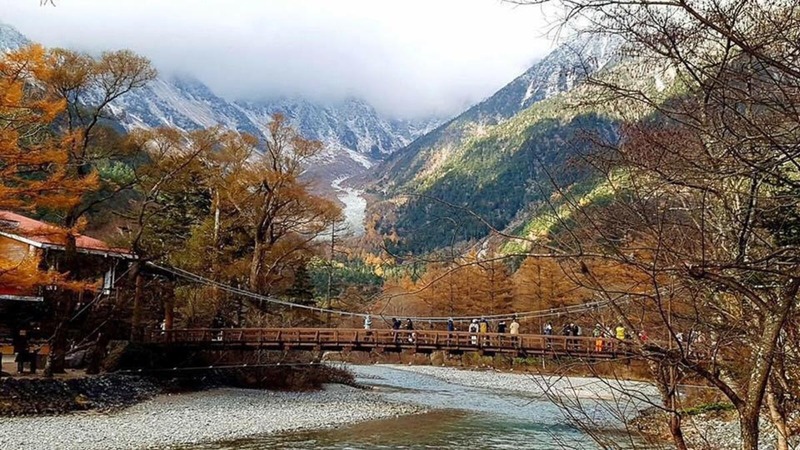 A popular route that covers the must-see spots in Kamikochi, the terrain on this path is not particularly rugged or steep and promises magnificent natural landscapes. 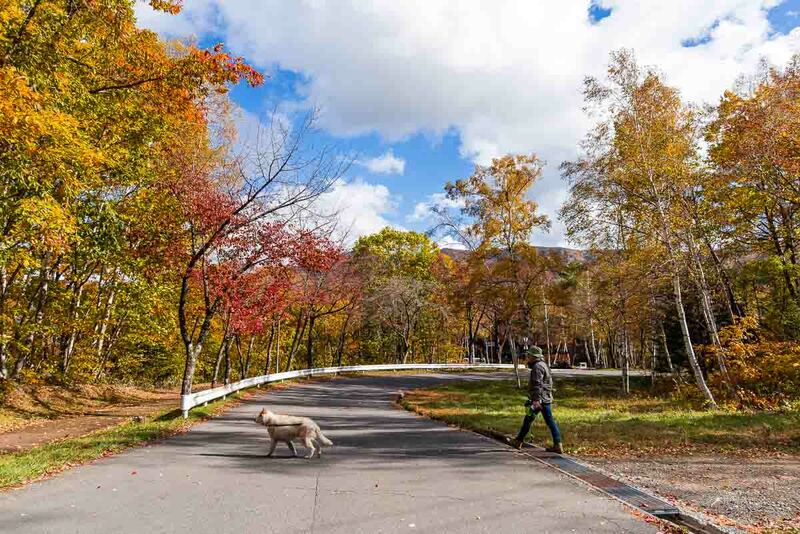 The trek begins at Taisho Pond, a 45-minute walk away from the hotel. The pond is created by the eruption of the Yake volcano (焼岳) and is known for its mirror-like reflection. In the early morning, it is shrouded in mist and together with the surrounding dead trees, create an otherworldly feel like something out of a fantasy novel. Next, continue towards Kappa bridge, which is named after the well-known human-like water monster Kappa (河童). Legend has it that the creature likes to grab unsuspecting humans who walk over bridges and drown them. This is the mid-way point of the trek and a great place to stop for lunch. Cafe Le Blanc terrace seating offers the best view of the Hotaka mountains while you dine on salt baked rockfish, a local speciality. For the more adventurous, most hiking trails begin here. 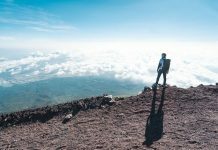 Remember, many of the hiking courses are not day trips, requiring you to stay one or even two nights, either at a mountain hut or in a tent. So make sure you are prepared! Drop by the Kamikochi Visitor Centre for more information before embarking on your journey. You can also hire a certified mountain guide for your adventure. 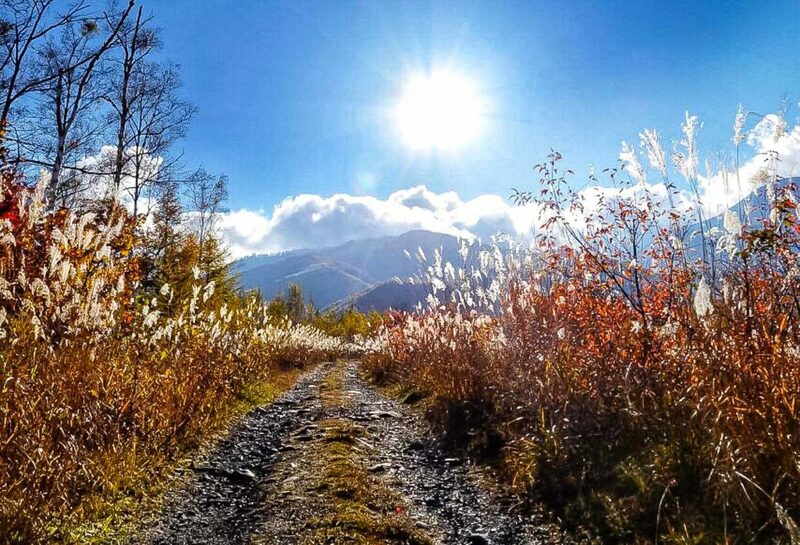 Finally, the trail leads you to Myojin Pond which is also the sacred site where the inner altar of Hotaka Shrine is located. The crystal clear waters of Myojin Pond have great significance to the Shinto religion, which places nature as the central object of worship. There’s an entrance fee of ¥300 (~S$3.65). The full trek from Taisho-pond to Kappa bridge to Myojin Pond is 7km and takes about 4 hours excluding lunch time. It’s best to start on this journey at sunrise to truly enjoy the beauty of the Taisho lake and complete it around mid-day before it gets too hot. 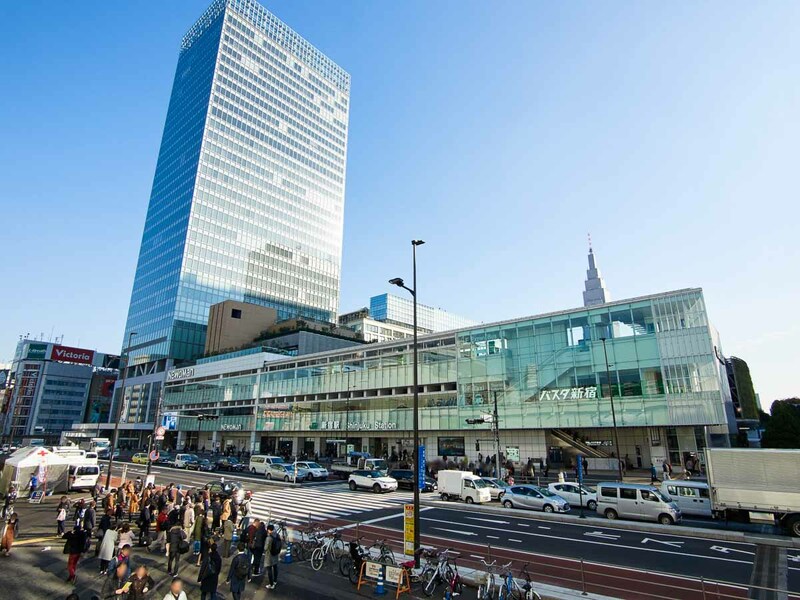 Simply hop onto Alpico’s express bus to get back to Shinjuku. There’s an option between standard and premier bus for the 5-hour journey, but I highly recommend the latter. 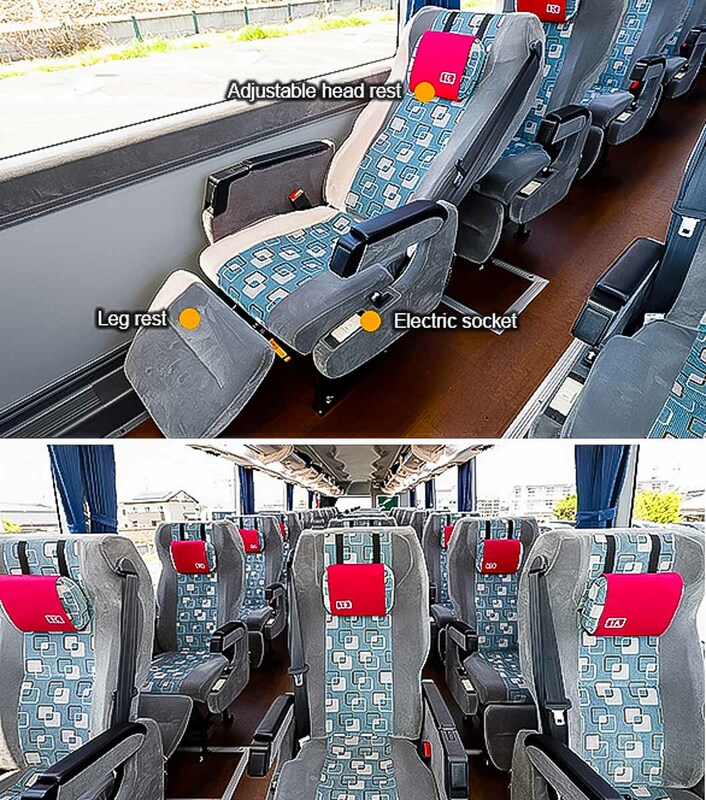 The seats are wider (3 individual seats per row), come with privacy curtains, WiFi, leg rests and a fully reclining seat. I slept comfortably without worrying about looking unglam and the WiFi was strong enough that I could stream my Youtube videos. It was THE best long-distance bus ride I’ve had, worth the extra top-up! Check the timetable and pre-book your bus tickets, especially during peak season to guarantee your seat. 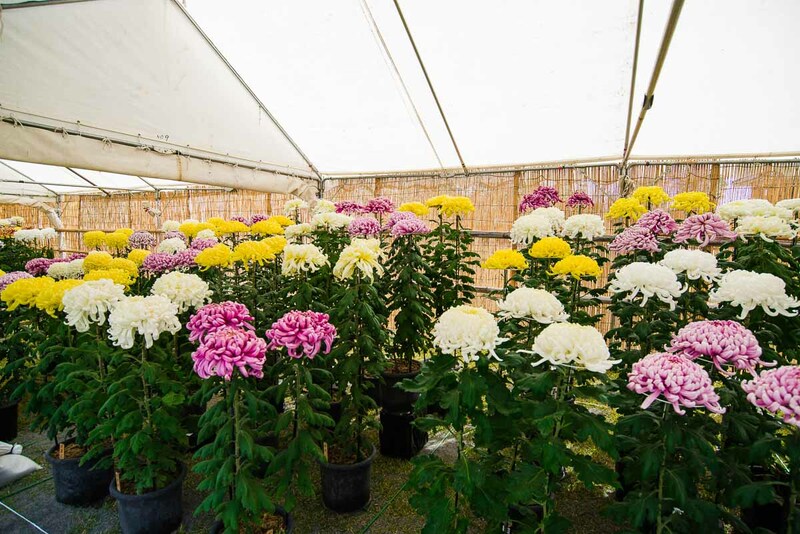 Prices range from ¥6200 ~ ¥9200 (S$75.40~$112.18) depending on the season. 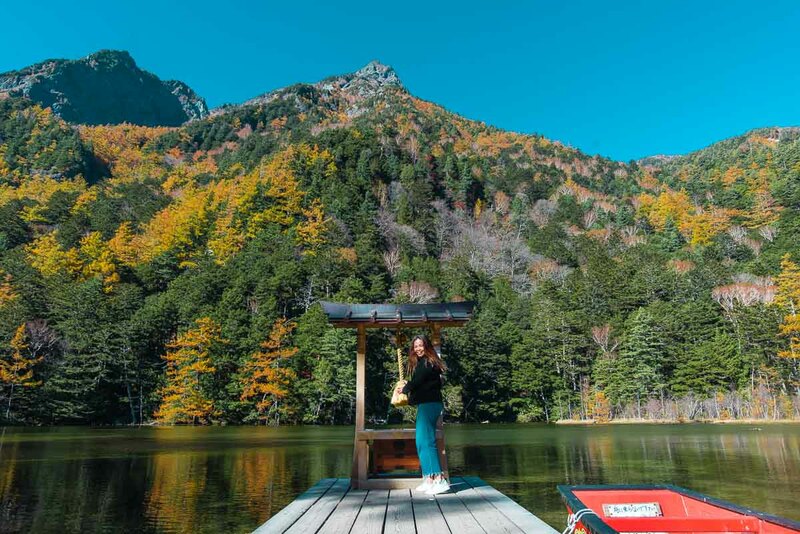 I hope our Nagano guide to exploring the top-rated spots in Matsumoto, Norikura and Kamikochi inspires you to embark on a different kind of travel. Trade in the usual city sights and reconnect with nature for a much-needed mental detox! Dinah enjoys learning new perspectives from people all the world while soaking in the beauty/nightmares of travel with random spontaneity. She has an intense passion for food and loves exploring local street kitchens.